What do you get when you mix powdery white sand with fragments of red coral crushed by waves over many years? 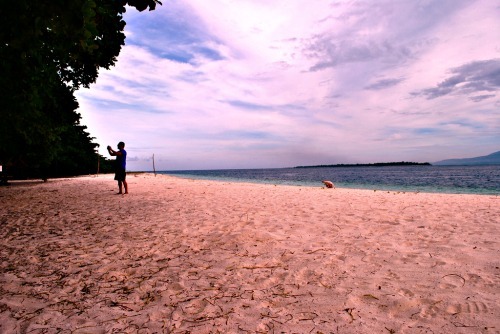 You get one of the only two pink sand beaches in the country -- Las Islas de Santa Cruz -- which the Department of Tourism (DOT) is looking at developing into a new tourist destination, particularly for backpackers. Las Islas de Santa Cruz, is also known as The Great and Little Santa Cruz Islands Protected Landscape and Seascape or simply Zamboanga’s Pink Sand Beach. The island is a 3,425-hectare marine reserve which is believed to be bigger than the country’s 24/7 party island, Boracay. It used to be operated by the Tourism Infrastructure and Enterprise Zone Authority (TIEZA) until it was turned over to the Zamboanga City government in 2011. Tourism Secretary Wanda Teo herself visited the island on Friday to see the pink sand beach for herself and assure tourists that tourism in the Zamboanga Peninsula is safe regardless of the old stigma attached to its name. “I personally came here because I want people to know that because ‘the Secretary of Tourism was here’, the more they should come here. I would like to show the world that Zamboanga is safe,” Teo said in a press conference. Teo, with other members of the DOT and media, assembled in the Basilan Strait at around 8 a.m. and took a 15-minute motorboat ride to the island escorted by the Philippine Coast Guard (PCG) and Philippine National Police (PNP). The motorboat she was on was also, coincidentally, pink. Upon arriving the island, Teo and company went shopping for accessories made of pearls and precious stones which were imported from Malaysia. Prices of freshwater pearl earrings start as low as Php50 and up. The team was later taken to a lagoon tour via bangka driven by teenagers and kids who are beneficiaries of The Yellow Boat of Hope Foundation which started as a national movement to help children who used to swim to school in the mangrove village of Layag-Layag, Zamboanga City. There, Teo got to interact with jellyfish and taste fresh sea grapes. After the tour, Teo vowed to spearhead efforts to develop the island seeking funding from an agency that used to handle operate it -- TIEZA. “I would like to promote Santa Cruz as a new destination because of the pink sand. I have spoken to people in charge to coordinate with us for funding. We will help them through TIEZA,” Teo said. Tourism Assistant Secretary Frederick Alegre, who also joined Teo in the trip, said that he had a “fantastic experience” visiting the island giving credit to its accessibility. “It’s so accessible. This is what global tourists want nowadays. The Secretary was very happy to see the island and has instructed TIEZA to provide funding to help facilities. We feel that the time for Mindanao has come,” Alegre said. “These are undiscovered territories as far as foreign tourists are concerned. We are confident that this will be properly promoted,” he added.